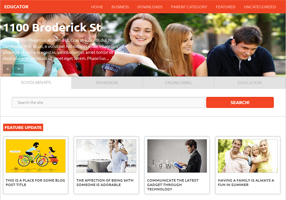 Educator is utterly stylish yet decent and sober theme designed for BlogSpot based websites. We have designed this template for all those colleges, universities and other institutions who want to have an amazingly professional website with not a lot of expenses. Educator Blogger template allows you an ideal online institution website, and at the same time it can also be converted in a full-time magazine blog. Though, it is designed for educational blogs, but one can also use it on magazine, Technology, Multimedia based websites.